Gazing at a friend’s out-of-control kale crop, I had one thought: stuff it. 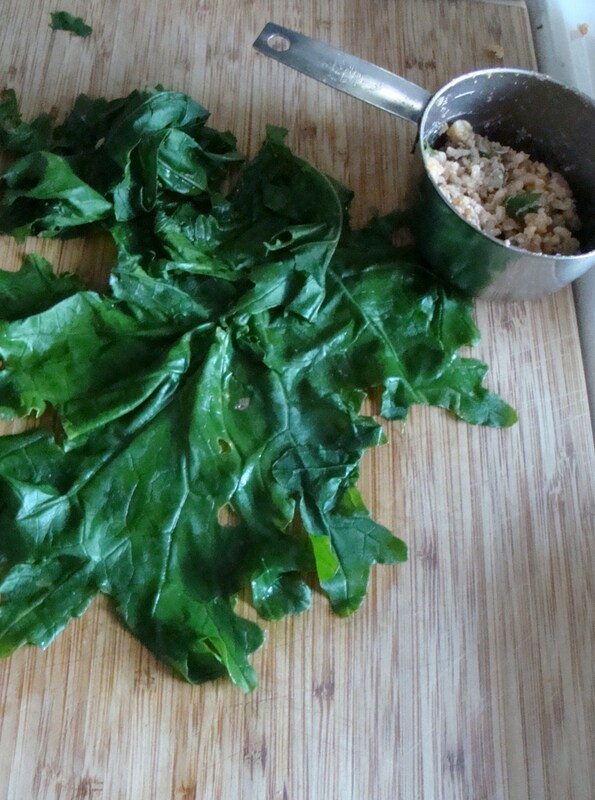 The size of the kale leaves reminded me of the grape vines growing wild up the back of my Brooklyn brownstone, and that I’d made a vow to harvest some of those leaves this year. Kale seemed like a good practice run. The same garden plot included an abundance of mint, so for the filling I turned to a favorite recipe for Armenian Stuffed Cabbage from New Recipes from Moosewood Restaurant, a hearty vegetarian combination of brown rice, walnuts, mint and a touch of tomato paste. Turns out, kale works beautifully, maintaining a vibrant green color after blanching, and even after the stuffed leaves are cooked, here in a thin tomato sauce. Stuffed kale doesn’t seem like a particularly light summer dish, but the tomato sauce is a no-cook version that’s ladled over the rolls in a pot and it’s all cooked on the stovetop. 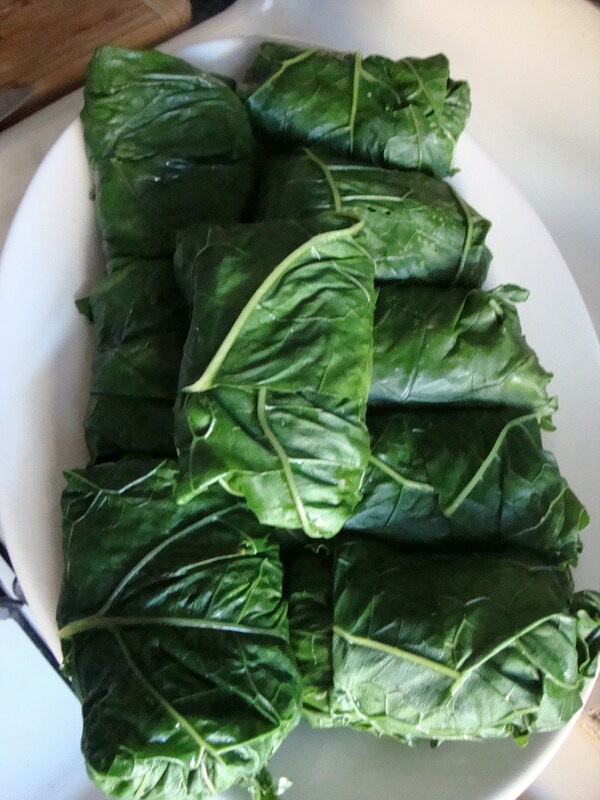 Prepping the kale rolls does take some time, but even a dozen rolls can be stretched for more than one meal. With that resounding success under my belt, it was time to tackle the grape leaves. 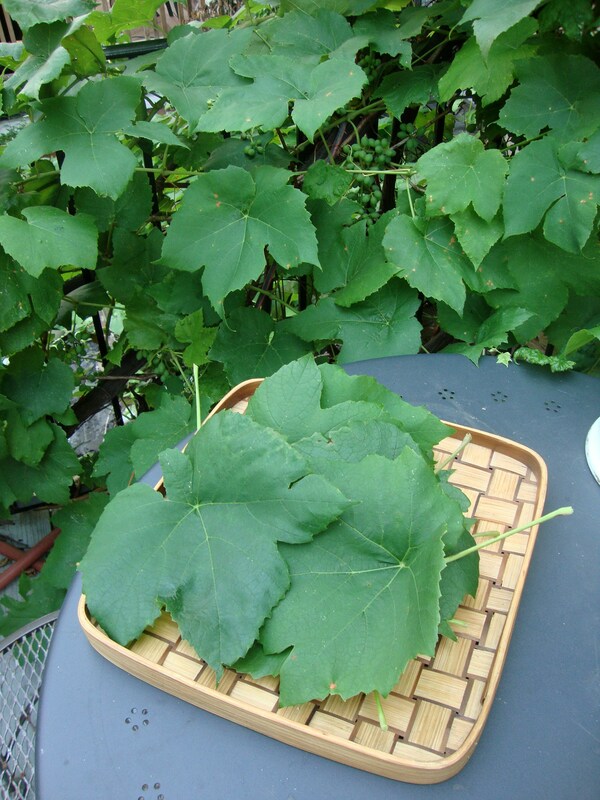 A little research offered a tip to blanch fresh grape leaves for 3-5 minutes, and it’s best to heed the advice. 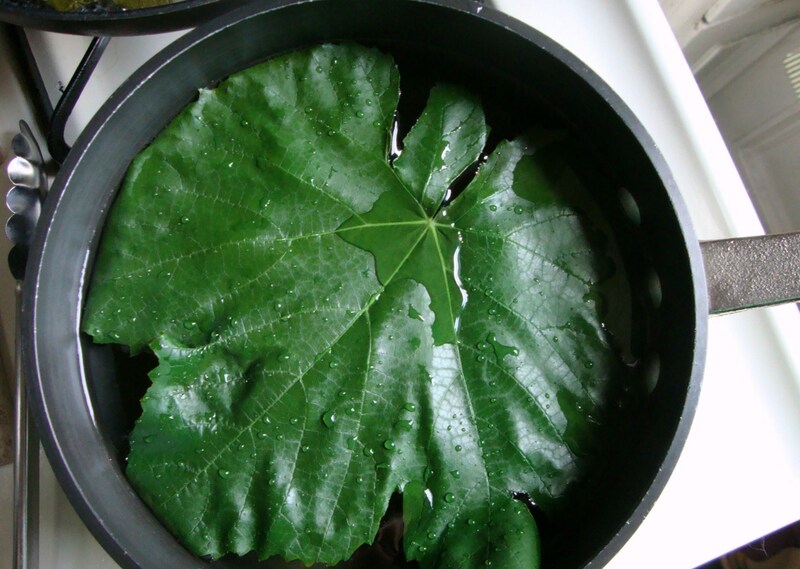 While the kale only took a few seconds to blanch, turning that bright green in simmering water, the grape leaves did require more time to become tender to the bite. They turn a dark, mossy green and yield a kind of fruity flavor. The leftover vegetarian brown rice stuffing was put to use for this first round. A more traditional meat-and-rice Greek filling with lemon sauce is in the offing for the remainder of the grape leaves that have been blanched and stored in the fridge. Back out on the deck, gazing at the grape vines growing helter-skelter across the railings and up the brick surface of the house, I had one thought: Why haven’t I done this before? Sounds like a wonderful summer meal…and I can just picture sharing it with friends on that Brooklyn deck gazing out at the beautiful grape vine. Almost seems like I’ve been there.